If you have a patch of trees on your property, it is possible for a deer to locate them. Deer like to feed on the leaves of small trees, but what is harmful is when deer use your trees as a scratching post. 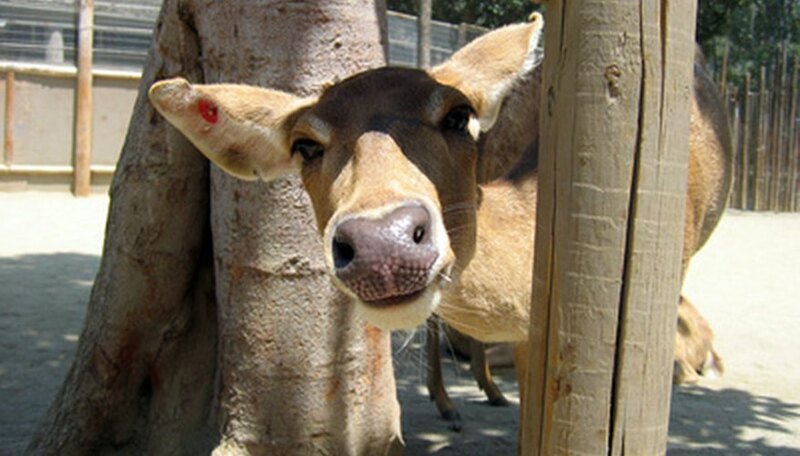 Deer will rub their antlers incessantly on your trees. You can use some tricks and techniques to keep the deer away from your precious trees. Mix your eggs and water together to form an all natural deer repellent. Pour this mixture in to a spray bottle. Spray your tree starting at the 6-foot mark. Work your way down to the base of the tree. Repeat after a heavy rainfall. Order a bottle of wolf or coyote urine. These two animals are natural predators of deer. Spray the urine on your tree. Again, start at the 6-foot mark and spray down to the base. Deer will think a wolf or coyote is nearby, and will stay far away from your tree. Place 2 cups of human hair in to a nylon stocking and tie it up. Repeat this until you have four to five human hair stockings. Tie the stockings to the branches of the trees you are trying to save. Humans are also predators to deer. If they suspect a human is around they will go the opposite direction. Use a tube of netting to protect any small trees you have from deer damage. You need two support stakes to hold the tubing up. The tubing will disintegrate itself over a period of three to five years, so you do not need to worry about removing it later on. Fence your property in with a fence that is at least 8 feet high. Deer can jump so you do not want to use a fence shorter than that. This is the only 100 percent reliable way to keep deer away from your trees. Instead of human hair, you can put two bars of deodorant soap in to each nylon stocking. Deer are also sensitive to pepper spray. Just be careful that you do not get any in your eyes if you choose to use it.